The Manhattan Project Beer Co., Mossberg Brewing (click to enlarge). In the two years since it opened in Trinity Groves, the Local Urban Craft Kitchen known as LUCK has made a name for itself in both the culinary and craft beer community. The work of partners Jeff Dietzman, Ned Steel and Daniel Pittman has been praised by media outlets like The Dallas Morning News and D Magazine (food, beer), and just last year LUCK appeared on an episode of Frankenfood on Spike TV. Yet, speaking as someone who follows the beer scene in North Texas, what stands out to me is the enduring support of the local brewing industry. And, just to be clear, this is something that goes well beyond having a locals-only beer menu that plays no favorites among a crop of over 40 different area brewing operations. Though, that alone qualified the place to earn the honor of having the "Best Local Beer Selection" in 2014, as cited by the Dallas Observer. Looking past that, LUCK shows its support of the industry in a number of other ways, both inside and outside of the actual restaurant. 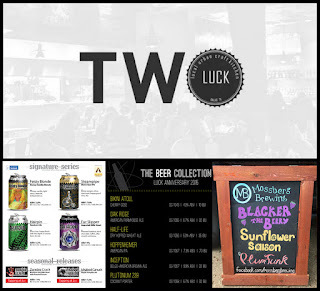 Some things are more visible, like weekly pint nights spotlighting the latest local releases, and events like LUCKapalooza and last week's anniversary party that bring attention to brewers just getting started in the business (more on that below). Then, there are the things that fly under the radar, like if there's a beer festival happening around town, or if a local brewery is having an anniversary or grand opening, it's a virtual certainty that one or more of the founders will be there. I know, because I can't think of a single event I attended this year where I didn't see one or more of them in attendance. On that note, Steel says the idea of being present in the local scene is something that's ingrained in the mindset of the three partners. "Honestly, our support at the local festivals, new brewery openings, tours, etc. has been an unspoken commitment. We ALL came to the conclusion separately that it was something that was important to us, that is, to show our support whenever possible. We weren't looking to be recognized for it, but we're appreciative when it gets noticed. More than a few of the local brewery owners/brewers have made a point to tell us, individually, how much it means to them to see us out and about, and for us that's just icing on the cake because we enjoy supporting the local beer scene." That support is something that goes both ways, as a number of those owners/brewers Steel is talking about were on hand as LUCK celebrated its second year. It's hard to argue, though, that the tap wall is where the support of local breweries is most evident on an everyday basis. The topic even finds its way into Steel's reflections on the past two years. "The old adage of 'time flies when you're having fun' holds true with us," he explains, "because while LUCK has been a lot of work, we're having a blast! The craft beer community welcomed us with open arms and we'd like to think we've reciprocated the gesture with each new brewery that has opened their doors over the past two years. We said from the beginning that if your craft brewery operates in North Texas and you want a tap on our wall, you've got it." Considering their approach up to now, it seems most appropriate that "local" was chosen as the leading term in LUCK's full name. As for the future, Steel makes it clear that we should expect more of the same in terms of how the restaurant will be run. "Going forward LUCK will continue to support the local beer scene by promoting the 'little guys (and girls)' making quality beer, while at the same time presenting a food menu that is approachable to everyone." Reading that, I'm reminded that the partners listed "sharing our passion for local food and beer at its best" as a goal on LUCK's website. Maybe it's just me, but I'd say they've done a pretty good job of that so far. As for my own reflections on the first two years at LUCK, I'll just say this in reference to something I wrote right after it first opened...I don't even remember what store-bought pastrami looks like. Of the breweries on hand Sunday, HopFusion Ale Works is the only one currently under construction. As of now, founders Matt Hill and Macy Moore are targeting an April opening date for their location at 200 E. Broadway Ave. in Fort Worth. At the event they served what will be both year-round and seasonal selections, including the honey-forward Feisty Blonde and a maple pumpkin creation called Ichabod Canuck. The highlight for me, though, was Zombie Crack, a very well-balanced bourbon oak milk stout brewed with roasted pecans. After many years as hobbyists, Mossberg's husband-and-wife team of Jim and Erin Brewer may be ready to take the next step. They are exploring options in Fort Worth, and if things fall into place they plan to be brewing professionally sometime next year with a focus on traditional farmhouse ales and mixed fermentations. While they would have a portfolio of standards, one-off brews and barrel-aged selections would be a part of the mix as well. Favorites of mine they've served at past homebrew events include the beers Balle de Foin (a French saison brewed with spelt) and Purple Drank (a sour brown ale aged on raspberries), with this weekend's pour of Blacker the Berry (blackberry sour) being among their best. Another husband-and-wife team forms part of the group behind The Manhattan Project, with Karl and Misty Sanford being joined by Jeremy Brodt on the venture. To be based in Dallas, beers follow the lead of the company's name in having a nuclear theme. Along those lines, offerings include Bikini Atoll (a cherry gose), Half-Life (a dry-hopped wheat) and Inception (a Belgo-American brown ale). Another brew called Hoppenheimer, a play on then name of nuclear physicist and "father of the atomic bomb" J. Robert Oppenheimer, is said to utilize a strain of Conan yeast, which is well-known for being used to ferment The Alchemist's Heady Topper.